Built in 1970 as the Duncan Foss by the Albina Shipyard under hull#419, at Portland, Oregon. The tug has a fine shear that sweeps down the 75-foot length from a high sea-going bow to a low fantail that carries most of the boat’s 24-foot midships beam. The classic rounded west coast style wheel house carries aft to a stepped-down galley and still lower fiddly section leaving ample room on the aft deck for a towing winch loaded with 1600 feet of 1 3/8 tow wire. A flying bridge atop the wheelhouse serves as a functional vantage for making up to tows. 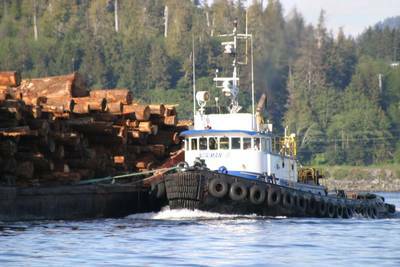 Since being acquired by Olson Marine Inc. of Ketchikan Alaska, the tug, has provided good service to the firm’s five boat fleet. A black hull and white superstructure with distinctive blue trim shows the excellent level of care that has kept the sound and worthy of a new set of engines to extend her life for several more revenue producing decades. Owner Rick Olson approached Mike Painter, his local Cummins dealer at South East Diesel & Electric in Ketchikan. The two men worked out a deal to change out the existing older Cat D348s rated at 703 HP each for a pair of modern EPA Tier 3 compliant Cummins QSK19 MCRS engines rated for 750 HP at 1800 RPM. The electronic controlled engines are built on Cummins’ legendary 19-liter (1150 cu.in. ) block that in its mechanical KTA19 version has served generations of Alaskan fishermen and mariners. It that has now won wide spread acceptance in Alaska in the electronic QSK19 version. A project team headed by Jamie Painter and Brian Pinkstaff, also of SE Diesel, was put together with engineer Kevin Johnson and Capt. Brian Ingerham of the Norman O along with Dave Kuehl, Olson’s port engineer. Over a three-month period in early 2014, the team cut, welded, sanded, painted, lifted and aligned to remove the old engines, modify the beds, and then install and align the new engines along with additional refurbishments. When done, the QSK19 engines were delivering 750 HP each at 1800 RPM to ZFW4400 gears turning 70 by 54-inch 5-blade stainless props from Sound Propeller. The engines were fitted with C-Command Engine controls with digital display as well as ECM Data and alarm reporting at each control station. To compensate for the lighter engines the team added 8000 pounds of concrete ballast. By the end of April the repowered Norman O was ready to go back into service. Sea trials demonstrated a maximum speed of 12 knots with a 38 GPH fuel burn per engine. At peak torque the tug makes 10.9 knots with a fuel burn of only 18 GPH per engine. The 75-foot tug has a 66-foot loaded waterline and a 19,000-gallon fuel capacity.